Where: First Congregational Church, 2345 Channing Way, Berkeley, CA. 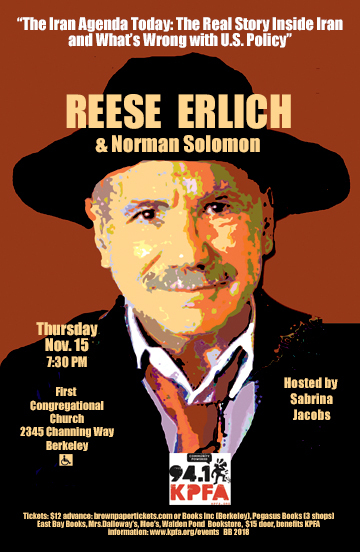 201811157:30 pm 201811157:30 pm America/Los_Angeles Reese Erlich & Norman Solomon KPFA Radio 94.1 FM presents Thursday, November 15, 2018 First Congregational Church, 2345 Channing Way, Berkeley Advance tickets: $12 : brownpapertickets.com :: T: 800-838-3006 or Pegasus (3 sites), Books Inc (Berkeley), Moe’s, Walden Pond Bookstore, East Bay Books, Mrs. Dalloway’s $15 door Based on frequent, first-hand reporting in Iran and the United States, The Iran … Continued First Congregational Church, 2345 Channing Way, Berkeley, CA. Based on frequent, first-hand reporting in Iran and the United States, The Iran Agenda Today explores the turbulent recent history between the two countries and reveals how it has led to a misguided showdown over nuclear technology. Foreign correspondent Reese Erlich notes that all the major U.S. intelligence agencies agree Iran has not had a nuclear weapons program since at least 2003. He explores why Washington nonetheless continues saber rattling, and he provides a detailed critique of mainstream media coverage of Iran. The book further details the popular protests that have rocked Tehran despite repression by the country’s own Deep State. Erlich offers insights on Iran’s domestic politics, popular culture, and diverse populations over this recent era. His analysis draws on past interviews with high-ranking Iranian officials, the former shah’s son, Reza Pahlavi, and Iranian exiles in Los Angeles, as well as his trip to Tehran with actor Sean Penn.Erlich’s book Target Iraq: What the News Media Didn’t Tell You, co-authored with Norman Solomon was a best seller in 2003. His fifth book, Inside Syria: the Backstory of Their Civil War and What the World Can Expect (foreword by Noam Chomsky) was published in 2014. In a starred review of Inside Syria, Publisher’s Weekly wrote that Erlich’s “insights and conclusions are objective and valuable… essential reading for understanding the current turmoil in the Middle East.